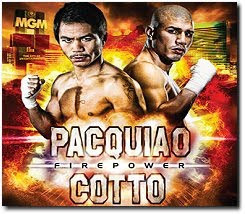 FREE Live Streaming Pacquiao - Cotto Fight entitled "Firepower". Aside from FREE Live showing of Pacquiao - Cotto fight in covered courts, coliseum and gymnasiums sponsored by government officials, you may also catch Manny Pacquiao and Miguel Cotto's "Firepower" fight via Live Streaming 1.) via PLDT Watchpad for those using PLDT DSL and 2.) thru Consumers Electronic Live (CEL) fair at the World Trade Center. So if you're nearby World Center, catch Pacquiao-Cotto "Firepower" fight for FREE. Aside from Manny Pacquiao and Miguel Cotto match, below is the list of other boxers playing at the "Firepower". Fight starts at 8:00am Manila time. Delayed telecast via GMA 7 starts at 11:00am. Princess Lieza Manzon - the only reason why I watch Pinoy Big Brother Double Up before. Too bad she's no longer on the show. I missed her. How I wish she'd pose on FHM in the near future. Calling FHM Guys. On Saturday November 14, 2009 (Sunday here in Manila) will be one of the toughest fight of Manny Pacquiao as he faces Miguel Cotto in Pacquiao vs. Cotto Firepower. Eventhough I could spend some time searching where I can find a live streaming of the fight, I think I'd rather pay coz this is something I got to see on the big screen. Watching online streaming maybe free but there will always be the factor of internet speed and quality. So if you're thinking of watching it free online, I'd say don't take your chances as you wouldn't want to miss the opportunity watching Manny Pacquiao knocking out Miguel Cotto. Go Manny Pacquiao! Knock Out Miguel Cotto. Just surfin the net when I come across this Youtube channel EvenDeMataCh02 about some extraordinary happenings on Wowowee. The channel owner is Even De Mata. Later I found out that it was the one Joey De Leon mentioned in Eat Bulaga some time ago. Here's a sample of the video that caught my attention. The title of which - SUS0 ng Audience Dinunggol Ni Willie. The Boys of the Boys Night Out (BNO) of Magic 89.9 with Valerie Concepcion. I'm beginning to listen to radio more lately. And one of my favorite is when it strikes 6:00pm Monday-Thursday. Why? Coz it's Boys Night Out time. Yeah Men.